Shark cage diving has always been something on my bucket list. It’s not necessarily very high up on my bucket list, but definitely something I’ve always wanted to have the courage to do. Although I am an adventurer, I am not the adrenaline, thrill seeking type. Lately, however, I have been going through a phase of ‘you need to try everything at least once’ – life is way too short and you don’t want to look back with regret. Now, my approach to adventure and thrill-seeking is very much head-on, so sit back, read on and sink your teeth into this jaw-dropping adventure. Quite an early start to the morning saw us departing on the daunting and nerve-wracking 2-hour drive to Gansbaai where we were greeted with smiling faces and a delightful breakfast before boarding the ‘shark team’ boat. We got to the launch site after a short 15-minute boat ride… and there we waited. We were advised that it could take 30 minutes or even an hour before we get the attention of a shark. We were in shark territory and when in shark territory, you work on their time. My nerves at this point were honestly all over the place. 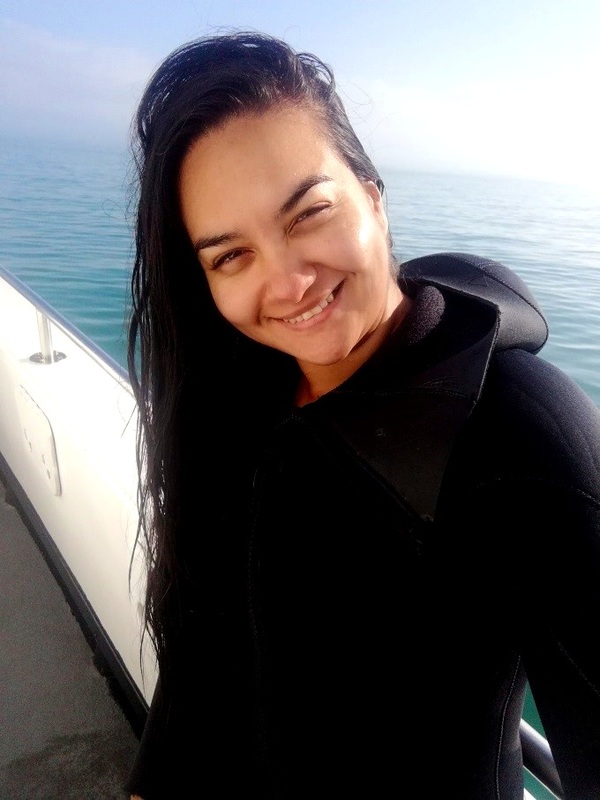 I was feeling quite scared and questioning if I really wanted to do this… I began asking myself “is this worth it?” It wasn’t even 5-minutes until we had not one, not two, but THREE sharks circling the boat. It felt like something out of a Jaws movie! Finally, the moment of getting in a cage presented itself. One of the team members handed me my wetsuit and boots which, let me tell you, was quite an interesting feat to try and get into. I probably lost a few kg’s with the amount of exercise I got trying to get into my wetsuit alone – it really did fit like a second skin. When getting into the cage, we were advised to push our backs against the cage and walk down five steps. 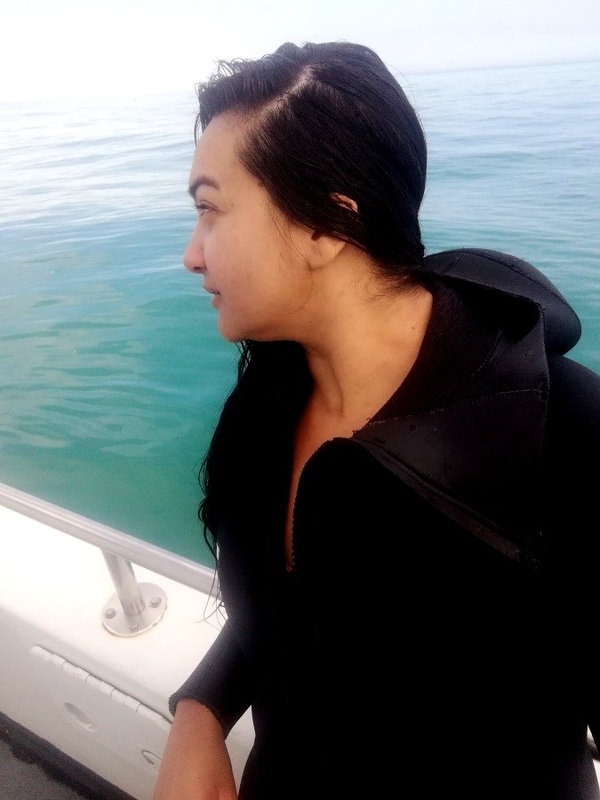 1, 2, 3, 4, 5 – the freezing cold water rushed into my wet suit and filled my boots. I was in the cage. Suddenly, a massive shark was swimming towards me, I screamed underwater as I honestly did not expect it so soon. To say I was nervous would have been an understatement; however, when I went down a second time, I felt a sense of calmness. I actually appreciated what I was seeing and how calm the sharks were in their natural habitat. This is not at all what I expected shark cage diving to be like. 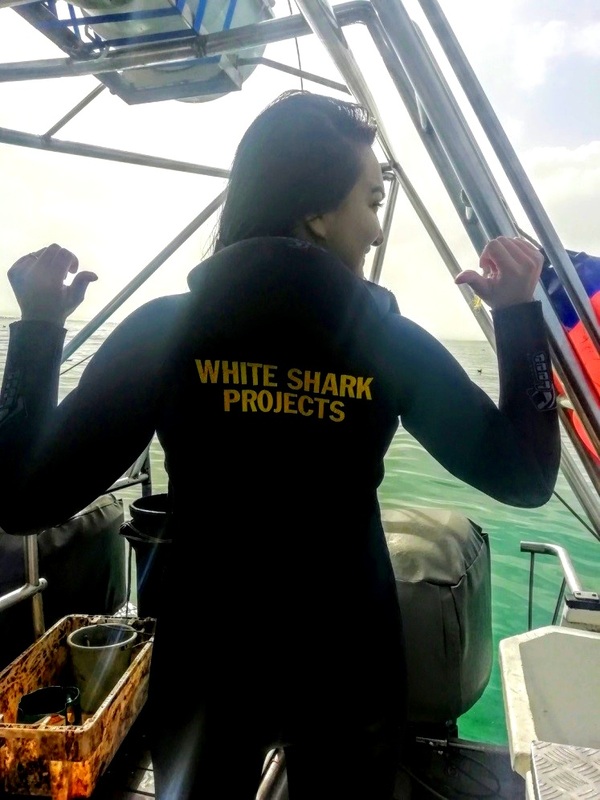 When you hear shark cage diving, you think of sharks bashing against the cage, shark teeth coming straight for you, or crazy scene from the movie, Jaws. This was not the case at all – we spent about 2 hours and 30 minutes at sea. It was the most beautiful experience imaginable. At one point I felt like one of the sharks made eye contact with me (crazy, I know)! This shark adventure was worth every second! Here is a video of my whole journey. I hope you enjoy watching and that this encourages you to go experience these sharks yourself. They are just too great to hate (😉). Until the next fintastic journey (😉).